Just curious: Where would ‘theHILL.com’ fall on your chart? I’m surprized that you rate MSNBC as more reasonable than CNN. Is that really the case? Confused about the Ars Technica ranking on the bombastic side of the chart. Comparing them directly to Breitbart, and worse than HuffPo, is ridiculous. for that matter, calling HuffPo noticeably worse than breitbart is questionable, but at least they’re in the same ballpark. Ars certainly has an left-leaning editorial voice – that part seems about right. i misread the chart regarding huffpo’s relative position wrt breitbart, ignore that part of my comment. Wow, that’s a great idea. Would love to see specific events organized this way by news organization; would be cool to do 3 major events in different categories and rank/organize them. Not to create more work, but that would be super-fascinating. Most didn’t cover in any meaningful way. Those providing most coverage (Young Turks and Democracy Now) not on the chart. Mother Jones needs to be moved down. The Washington Post and NYT need to be moved further Left. And The Washington Times needs to be moved to the other side of the line. Slate needs to go down and to the left. Obviously you don’t read the LA Times enough! I would have moved it a touch further left, and just into the lower left quadrant. They are unabashedly supporting far left positions and very anti business (for any business not pushing the liberal agenda). Very slanted reporting with lots of unsubstantiated previously published references — many from the LA Times itself! Self referential and left serving. And NPR should be on there, mid-left in the semi-sane vertical. I can’t believe taxpayers pay to support such liberal agenda. NPR SHOULD BE in the exact center in a perfect world. “Mad” Republicans are always attacking NPR. I have to disagree with your placement of the Weekly Standard in relationship to Breitbart. WS is far more reasoned than BB. Agreed. As a reader on the right, that’s the one that threw me too. The Weekly Standard is generally level-headed and reasoned. Bombastic is Breibart’s MO. I’d also put Drudge further down towards bombastic too. RT is utter trash and a complete tabloid. Its placement on the left and near rational says to me that you are just a bullshitter. RT is different. It is a Russian propaganda organ whose intention is to influence US politics in a direction, left or right, that suits Russia. It really doesn’t belong on this chart. Otherwise, this is cool. I’d put the WSJ further right since Murdock took over. The slant in both the reporting and the opinions has skewed a lot since then. Also, The Economist is an interesting one. Despite a belief in free markets, their social views are aligned with the left, so I’d probably put it left of center rather than right. I would find this graph a better resource if it were less bombastic. You are using the wrong labels and thus making this page less valuable. The vertical dimension should be fact/reason-based versus emotion/opinion-based. Using bombastic/insane means making a value judgment that one can argue with forever, not a criterion that is worthy of debate. Bombast is not quantifiable. Case in point: Upworthy. They are not trying to be factual news, they are appealing to emotions. They are very clear about it – their mission uses words like ’empathy’ ‘surprised, happy, inspired, motivated, even sad’. Who are you to call them insane or bombastic? Emotion-based, yes, and thus not a good source for unbiased facts. But appealing to emotions is an entirely sane thing to do. It is important to keep their emotional appeal mission in mind when consuming the information on their site, but it is incorrect to judge them for it. (I picked them as an example, I have no connection to that page, the principle applies so others). Yes, it’s an issue of semantics but semantics is what differentiates these sources of news. Please reconsider how you think about and label this axis because the point you are making and the graphic itself is so worth-while. MSNBC and CNN are misplaced; they should be much lower and much farther left. Vast omissions of relevant info and extraordinary leftist propaganda have moved these to far below a line of embarrassment – they are national tragedies and quite dangerous to personal responsibility and the freedom that flows from said existential element. These 2? Much lower – and much further left. Not bombastic – but definitely carrying the appearance of insanity. Further note; American Thinker should be – in fact – above the line and further right. The Nation, In These Times, Counterpunch, The Washington Spectator, and the Hightower Lowdown? And what am I leaving out? Please include PBS NewsHour. Among the best there is! The Daily Signal should clearly be in the upper right quadrant. As a media outlet of the respected Heritage Foundation, it doesn’t belong in the “bombastic” quadrant! Why is Vice in the “insane” axis? Just because they’re produced by Bill Maher? It’s some of the best investigative journalism I’ve ever seen, and for most parts neutral. It seems useful for those outlets I don’t know. But then I note that Breitbart is only slightly less insane/bombastic to the middle-right than Mother Jones is insane to the far left: I find that incredible, by which I mean “lacking credibility”. Also, I find that Rolling Stone is positioned as more insane/bombastic than Breitbart. I haven’t found MSNBC insane/bombastic at all for a couple of years, and certainly don’t find CNN more insane than Fox. Finally, Fox is apparently middle-right. As the creators of the Tea Bagger devolution, I think that’s misguided. Economist is unapologetically center-left you have them center-right. The Toast isn’t posting anymore, so I’m not sure why they’re included on here. Also, conflating “bombastic” & “insane” make for an unfair comparison of InfoWars and The Toast. The Toast leans/leaned left, but there was always a division between the more bombastic humor pieces and really well-reasoned political/social/personal essays. I have the same issue with the placement of Mary Sue. At least for topics in finance, Zero Hedge delivers thorough and thoughtful analysis. Haven’t read other things by them, but the quality of work I have seen, I seriously doubt they belong anywhere near the “insane/bombastic” end of the spectrum. I appreciate this a lot, and agree with much of it, but am wondering why The Christian Science Monitor isn’t in there? 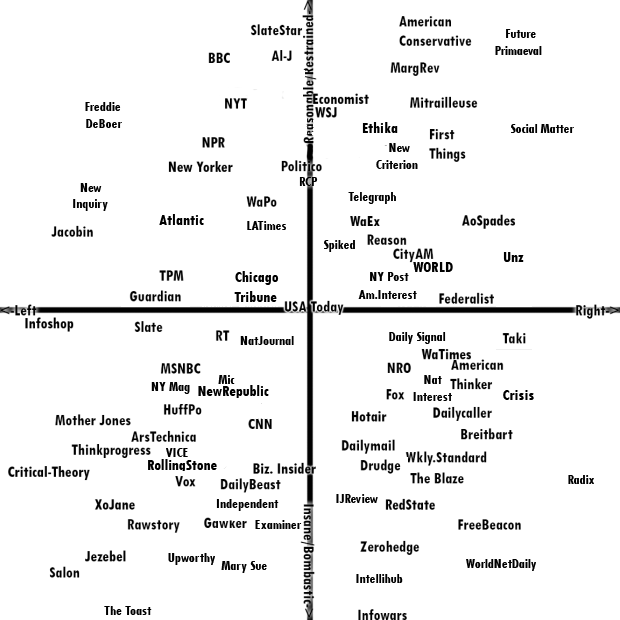 I find that to be a very objective news source that I think would be placed on the middle/upper line. Slate appears twice.I would move USA Today down closer to CNN. Would also move WaPost a little further south. Thanks for your hard work. A suggestion if I may. Please consider adding Democracy Now! and the Intercept to the line up. Thanks! PBS, AP, and The American Spectator?